Milhouse, Emilicious, Sweet Tooth and I decided to share some dishes while Gadget Girl and Mr. Blueberry did their own thing. 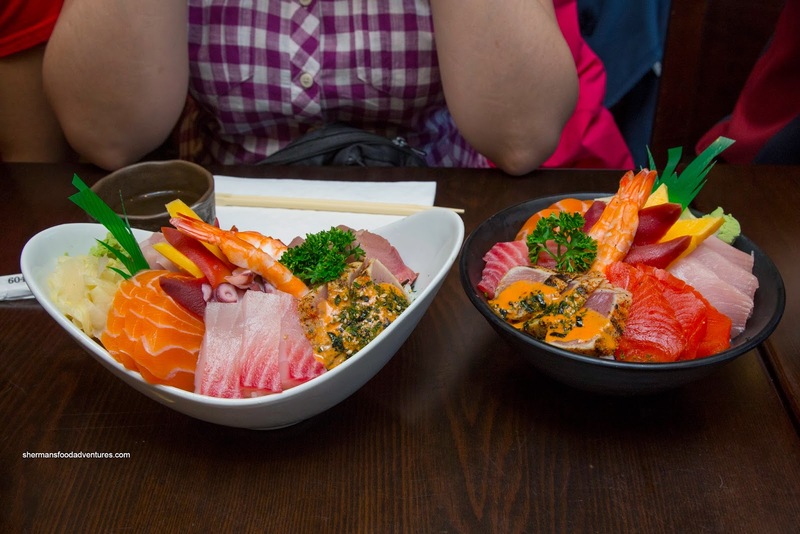 However, we had one item in common being the Chirashi Don ($10.95) except we had the Deluxe Chirashi Don ($13.95). Interestingly, other than the shape of the bowls, there was only minimal differences between the 2. We felt that the extra $3.00 was not worth it. The slices of fish were all acceptable and we liked the spicy sauce on the seared tuna. I wasn't a big fan of the sushi rice though as it was dry, hard and under-seasoned (I really didn't taste anything). 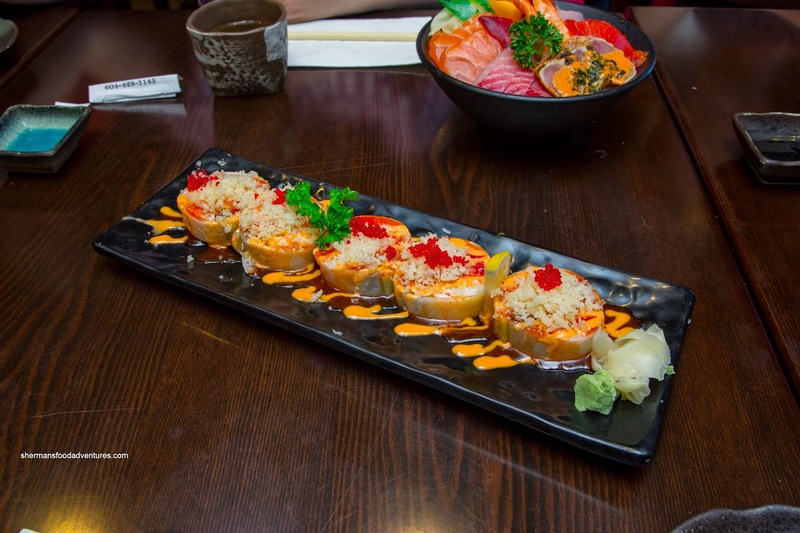 For our specialty roll, we tried the Crazy Rabbit consisting of unagi, tamago, ebi, imitation crab and yam tempura rolled with sliced cucumber. 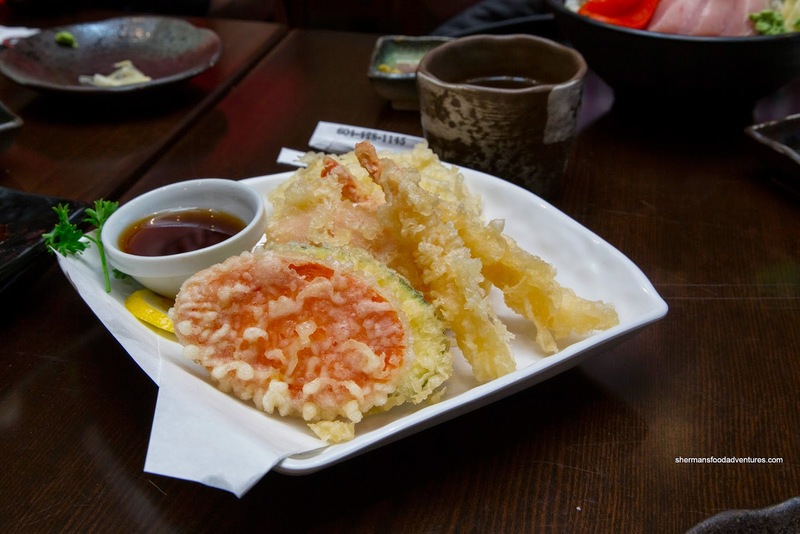 On the outside, it was dressed with tempura flakes, tobiko and sauce. Without sushi rice, this roll was texturally soft except for the crunch of the cucumber. 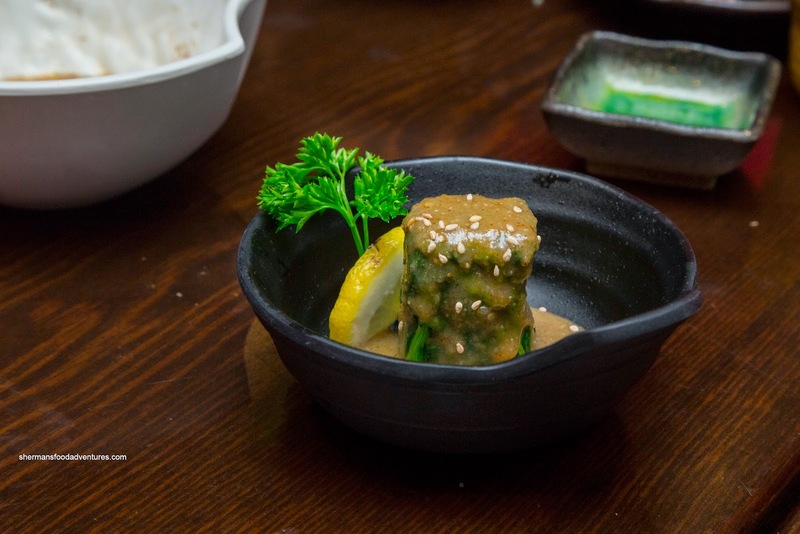 It was really hard to differentiate any of the ingredients as it just melded into one, especially with the creamy, salty and sweet sauces on the outside. 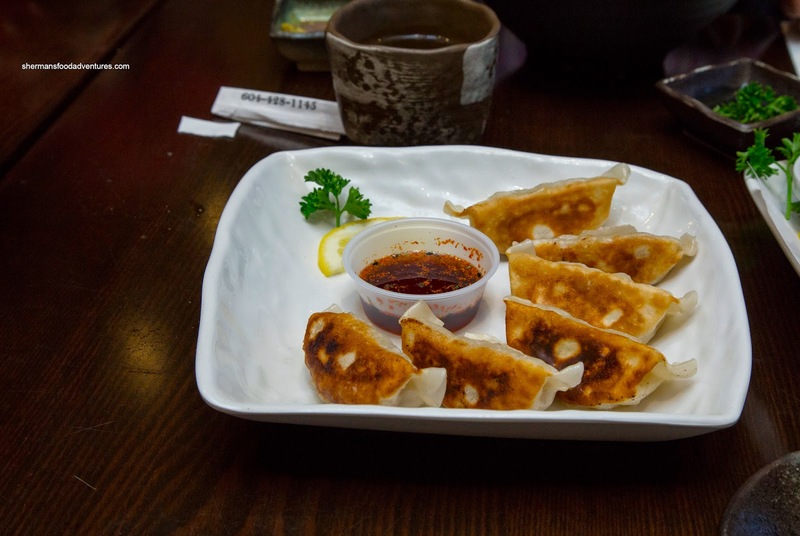 We got a few smaller appies as well including the Agedashi Tofu, Gomae and Gyoza. 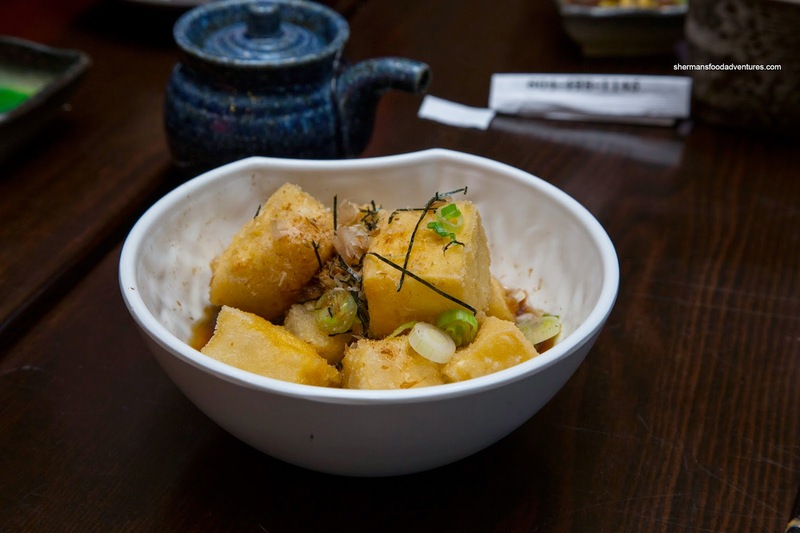 I found the tofu to be relatively silky with a mostly soft exterior. Even the pieces not immersed in sauce, they were not particularly crispy either. They actually forgot the gomae and it came at the end of the meal. The spinach itself was tender and nicely arranged in the small bowl. Even though there was ample dressing, it wasn't particularly sweet nor aromatic. Nicely seared on the bottom, the gyoza featured a relatively thin dumpling skin. It was slightly chewy while still soft. The filling was a bit cabbage heavy though, hence, the meat really didn't make an impact. Our order of Assorted Tempura arrived pipping hot. It wasn't greasy per se, yet it wasn't devoid of oiliness either. When I bit into the sweet potato, it was crispy, but the inside was a little oily. The batter could've been slightly less thick on the ebi, but it was fine on the veggies. 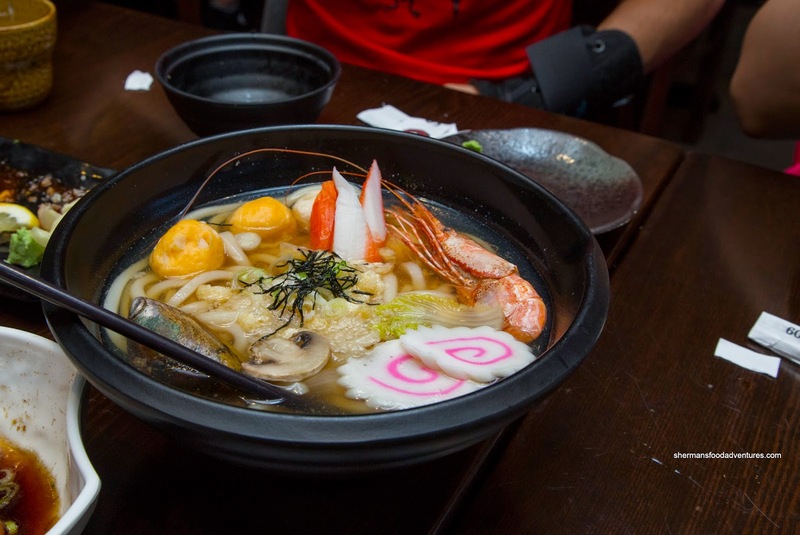 Lastly, we had the Seafood Udon which was not bad. The noodles were chewy while the dashi was on the sweeter side. I really didn't like the spot prawn as it was obviously not fresh (not the season). It was unappealingly mushy. Despite this (and all the other inconsistencies), the food was okay and considering the location (Oakridge), the prices were reasonable. 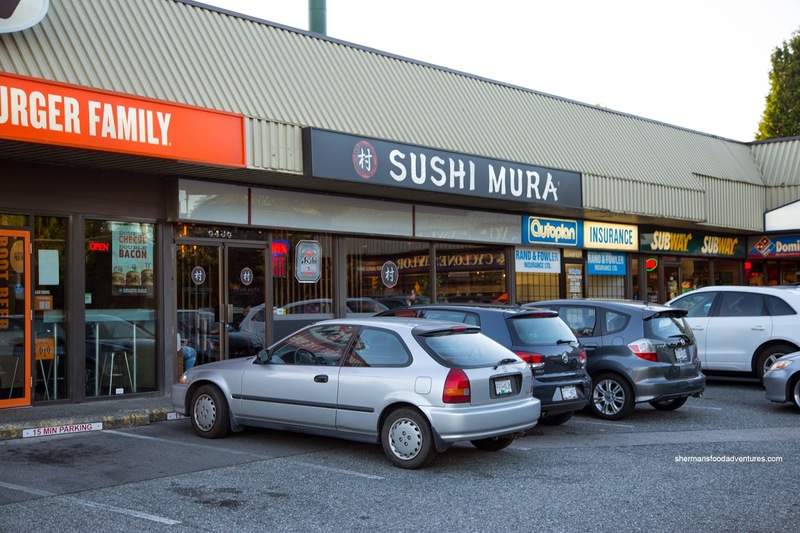 But, if one wanted better sushi, best to drive down Oak and eat at Applause.